The Windy City produced a couple of stellar races as Brigid Kosgei closed in a hurry to join the sub-2:19 club with a runaway win in 2:18:35. 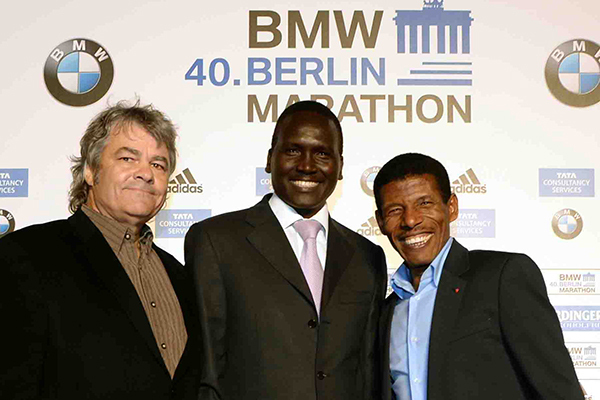 While the men’s race wasn’t as speedy, it was rich in competition as race director Carey Pinkowski brought back pacers and reigned in a bevy of talent from Farah and former training partner and defending champ Galen Rupp, to past champions Abel Kirui and Dickson Chumba, reigning world champ Geoffrey Kirui, Dubai winner Mosinet Geremew and Rotterdam winner Kenneth Kipkemoi—and many more. A hard surge by Geoffrey Kirui at the 30K fluid station stoked the competition and drew Mo into the race. Kirui closed out a 14:27 segment with a 2:49 K and crossed the mat in 1:29:43—2:06:11 pace, then strung out the 9-man lead pack with a string of sub-2:53 kilos. The pack was pared to 6 by 35K (1:44:16 – 2:05:48 pace) as Kipkemboi joined Kirui at the front, while Mo, Geremew, and Suguru Osaka covered the move. As did Rupp, but as he turned into Chinatown he started to slip off the pace—just as Kirui chose not to pit for fluids and threw down another surge to challenge the drinkers. Farah also had some misadventure at the fluid station, tweaking an ankle. “I picked up my bottle and as I went across I put my foot in a ditch,” he explained. 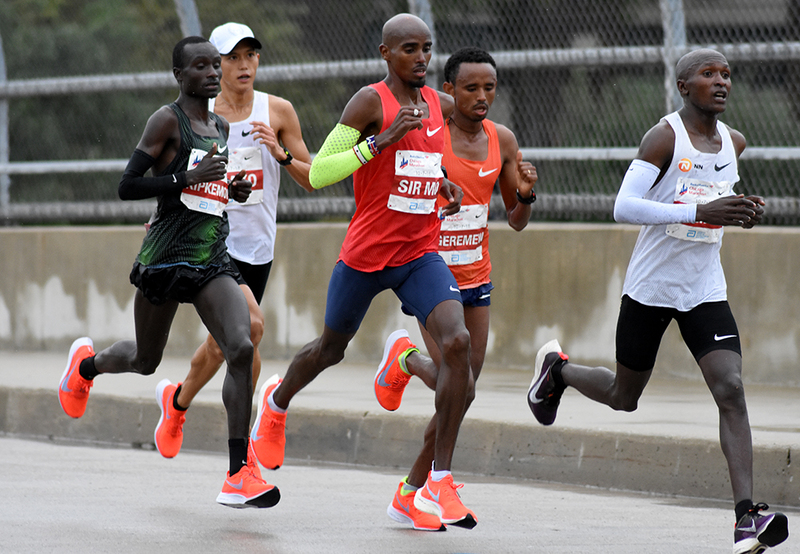 “It wasn’t too bad but quite painful for a mile or so.” Mo ran down Kirui and the 5-man lead pack regrouped and ran in tight formation as they rounded a turn and headed north back into the wind for the final 4K. 6. Geoffrey Kirui (Ken) 2:06:45 (63:03/63:42); 7. Abel Kirui (Ken) 2:07:52 (63:04/64:48); 8. Taku Fujimoto (Jpn) 2:07:57; 9. Bedan Muchiri (Ken) 2:07:59; 10. Birhanu Legese (Eth) 2:08:41; 11. Mohamed Reda El Aaraby (Mor) 2:09:16; 12. Yohei Suzuki (Jpn) 2:12:18; 13. Elkanah Kibet (US) 2:12:35; 14. Aaron Braun (US) 2:13:16; 15. Jonas Hampton (US) 2:14:19; 16. Parker Stinson (US) 2:14:29; 17. Ahmed Osman (US) 2:14:40; 18. Bernard Kipyego (Ken) 2:16:12; 19. Yuki Kawauchi (Jpn) 2:16:26; 20. Tyler McCandless (US) 2:16:37. 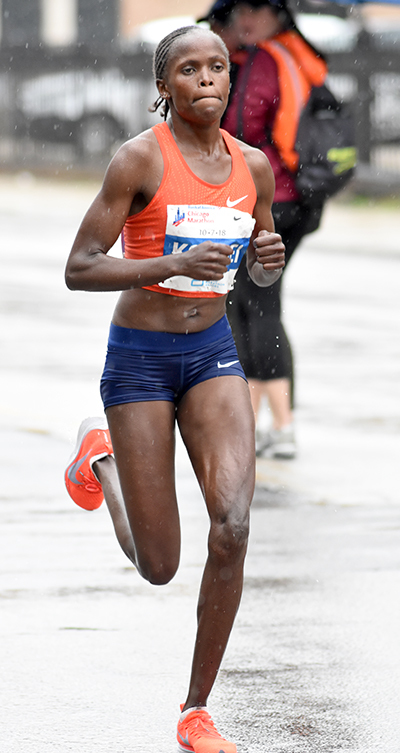 The women’s race lacked a similar competitive luster simply due to the way that Brigid Kosgei scorched the final 12K. After passing halfway in 70:09 she ran with Ethiopian duo of Roza Dereje and Shure Demise and 2-time Chicago champ Florence Kiplagat as they crossed 30K in 1:40:01—2:20:42 pace. Then the 24-year-old Kosgei went on a tear, running 15:36 of the subsequent 5K, followed by 15:47 through 40K as she stormed home to become the No. 7 performer, and moving up from her runner-up finish here last year. Dereje finished 2nd in 2:21:18, and Demise 3rd in 2:22:15. The U.S. placed 4 in the top with, with Sarah Crouch 6th, Taylor Ward 7th, Kate Landau 8th and Marci Klimek 10th. Former triathlon star Gwen Jorgensen’s much anticipated race turned out to be a 2:36:23 “learning experience” in 11th. 2. Roza Dereje (Eth) 2:21:18; 3. Shure Demise (Eth) 2:22:15; 4. Florence Kiplagat (Ken) 2:26:08; 5. Veronicah Nyaruai (Ken) 2:31:34; 6. Sarah Crouch (US) 2:32:37 PR; 7. 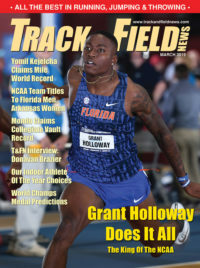 Taylor Ward (US) 2:32:42 PR; 8. Kate Landau (US) 2:33:24 PR; 9. Melanie Myrand (Can) 2:34:08; 10. Marci Klimek (US) 2:34:53; 11. Gwen Jorgensen (US) 2:36:23; 12. Katie Matthews (US) 2:38:16; 13. Chirine Njeim (Leb) 2:43:04; 14. Alexi Pappas (Gre) 2:43:38; 15. Jess Draskau-Petersson (Den) 2:44:11.